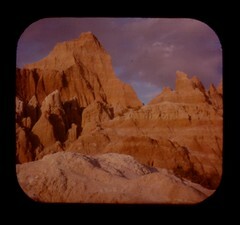 I’ve just digitized 21 scenes from my husband’s vintage View-Master slides — a memento from his own childhood trip to the Badlands with his family, in the summer of 1969. He has a vintage red plastic viewer. To be honest, it was a bit difficult scanning these images, since the film images are eensy-weentsy, and the paper reels are circular (meaning they wouldn’t fit in my scanner’s film holder, so each needed to be cropped and straightened manually. But I just love them. And it was worthwhile, in an archival sense: some of the paper View-Master reels are coming unglued, allowing the films to fall out. Now at least the images have been saved, and we can continue to enjoy them.